One of the first things you learn as a sailor is that you don’t get far with no wind in your sails trying to run head-on into a spring tide. Seems like that’s the last thing you learn as a Prime Minister. My ships cat Mrs. Nelson’s got more chance of sweet talking that Michel Barnstormer into changing tack. Nor his deputy, that Sabine woman – takes me back to my old Latin master Chug Summers expounding the myth of abduction. There’s a rather wonderful Ruben’s painting about it in the National in which the women are wearing Flemish frocks, shows they even had Brussels fashion edicts in the 17th century! But I digress. This nation has a great sailing heritage and time and again it has been left to her sailing folk to pull her out of the doo-doo when it all seemed to be going down the heads. 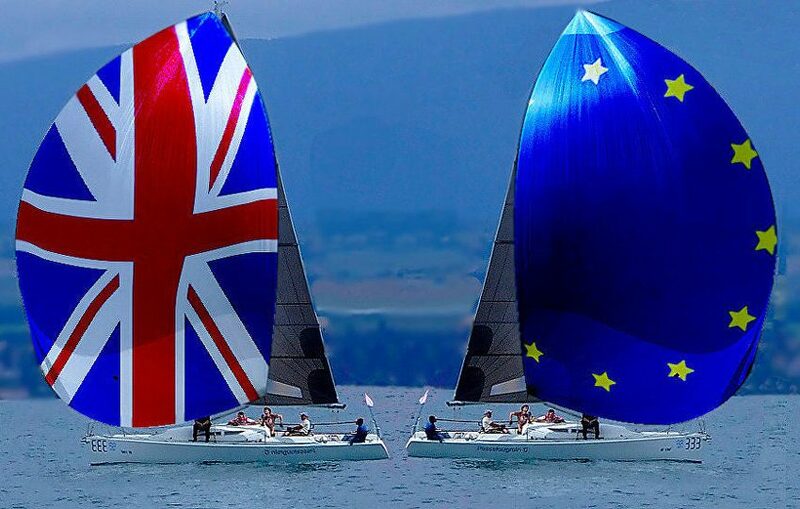 So my heads-up on the situation is this – ‘Let the sailors decide!’ A sensible idea indeed and what could be fairer? So here’s my plan. Those good folk at Seafarer World HQ (strange that it’s just off the North Circular, but needs must I suppose) have agreed to put together an online poll. Don’t worry, Seafarer, like all great institutions, keep their votes totally anonymous. All you have to do is cast your vote, they’ll give me the results and I’ll pop down to Chequers and tell the PM what to do about it all over a bottle of pink gin. Capiche? IN – if you voted today you’d vote to remain. OUT – if you voted today you’d vote for a hard and fast Brexit, let’s stop fannying around, bite the bullet, stop talking, cut to the chase and make no bones about it and get the deed done. SHAKE IT ALL ABOUT – this is a fluffy sort of middle category for those who think we should get out but want the feeling that they’re still in. A sort of ‘Marie Antoinette vote’ of keep your hands off our Bath Buns but let us eat your cake too. Hmmmm, wonder if that Sabine girl’s any good with the marzipan – I do like a slice of Battenburg. There’s one more question and that’s asking you if, knowing what you know now about the mythical tales told from the NHS Battle Bus (a story well worthy of Chug Summers), or for any other reason, you have changed your mind since the original plebiscite. Hokey Cokey? Rest assured, once I’ve put the PM straight, you’ll be next to know the result. PS: Alternatively, why not escape to the BVI till its all over with savings of 30% available. 4 weeks on a new Oceanis 41 in the BVI from £9995. PLUS 5% additional discount for repeat bookers. AND an additional 5% discount for repeat bookers. ATOL-protected Flights including luggage from as little as £195 per person! Book your ATOL-protected flights with us too! PLUS an additional 5% discount for repeat bookers! Location: Kos Marina, Kos, Dodecanese, Greece. Save up to 25% off all flotilla bookings for 6th, 13th, 20th, 27th July & 3rd August. If you are travelling solo, then avoid the single supplement! Book a week at Nikiana Beach Club and get extra RYA Sailing lessons free. Selected Departure Dates: 12th May *Sold Out*, 23rd June & 29th September. 23rd June £599 per person including flights & transfers! 29th September £499 per person including flights & transfers! *When booking a flight-inclusive package on our flight from Gatwick. Save 20% off cruises on 19th & 26th May, includes Half Term! £949 per person, including flights and transfers! £995 per person, including flights and transfers! £636 per person, cruise only!